Tackling a mental health issue can be difficult. Add on the pressures of your day job, and the fact that you haven't actually told your employer you're suffering, and suddenly, coping can feel almost impossible. This is the situation for many people living with mental health issues, without the support of their employer. But being honest with your employer can really help. Opening up about your struggles and having them understand your needs can make your working life a lot more manageable. Of course, this isn’t easy, and discussing such a personal issue with your boss can feel like a challenge in itself. You might be worried about how they will react or if they will even understand. But despite this fear, it’s important to remember that there is support available. You’re not alone in this. CV-Library recently revealed that over a third (35.2%) of UK professionals admit to suffering from mental health problems. If your mental well-being is affecting your work, or your work is affecting your mental well-being, talking to your employer (or someone within the organisation) can really help. Below, writer Alice from CV-Library shares her tips on how you can start the conversation with your employer and ensure you receive the help and support you need. Before you approach your employer about any mental health issues, it can be helpful to know in advance what it is you’re going to say, why you’re telling them and what you want to achieve from the conversation. Maybe you want some time off, you need some additional support, or maybe you just want to explain how your mental health is being affected at work. To make sure you get the most out of the meeting, it might also be worth knowing what support you need from your employer. If you give them suggestions of practical ways they can make your day-to-day less stressful, it will be easier to put these into action. Maybe the option to work from home or arranging flexible working would benefit you. Be sure to write down your thoughts before the meeting, so you have a good idea of what you’re going to say. This will help you to feel more prepared if you’re nervous about telling them. Mental health is a personal subject, so it’s understandable if you’re hesitant to tell your boss. Ultimately, it’s your choice what you disclose and there’s no need to go into specifics if you don’t feel comfortable doing so. It can be helpful to talk about the areas of work where you’re struggling, so you and your employer can discuss the support you need. You might feel like your job is causing (or worsening) your mental health problems. Perhaps mounting workloads or big projects are making you feel stressed and anxious. If so, your employer may be able to make some changes to ease some of the pressure. When you’re ready to speak to your workplace about your mental health, you need to find the right time to do so. Perhaps book a one-to-one chat with them, making sure you have a private room available to you with plenty of time. There isn’t a wrong time to bring up your mental health, but you might feel better talking more openly if you’re in a safe, comfortable space. Mental health is a sensitive issue, so it can help to talk to someone you trust. This doesn’t have to be your manager if you’re not comfortable disclosing this information. Perhaps there is a colleague you get on with, or another manager you are happier speaking to. Alternatively, you can speak to your HR department. This is completely confidential, so nobody else has to know if you don’t want to, but they can help you understand your options and explain your company mental health policy if there is one. If your employer is struggling to understand and you’re able to get a note from your doctor, it’s worth passing this on. It can make the situation a lot easier to explain. Your doctor will be better able to describe the medical implications of your mental health at work, in a way your employer will understand. They may also be able to suggest some changes your employer could make to help you – for example reducing your workload. The Equality Act protects you from discrimination at work and if you feel like you’re facing unfair treatment because of your mental health, you have a legal right to challenge this. Employers have a legal duty under this act to make ‘reasonable adjustments’ to those who need support. If you have approached your employer but not received the support you need, or have been treated unfairly or discriminated against as a result, consider taking further action. You can raise a formal grievance, but if nothing changes, you can make a claim with the Employment Tribunal. 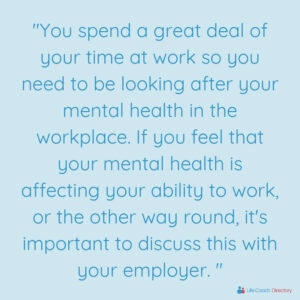 All in all, you spend a great deal of your time at work so you need to be looking after your mental health in the workplace. 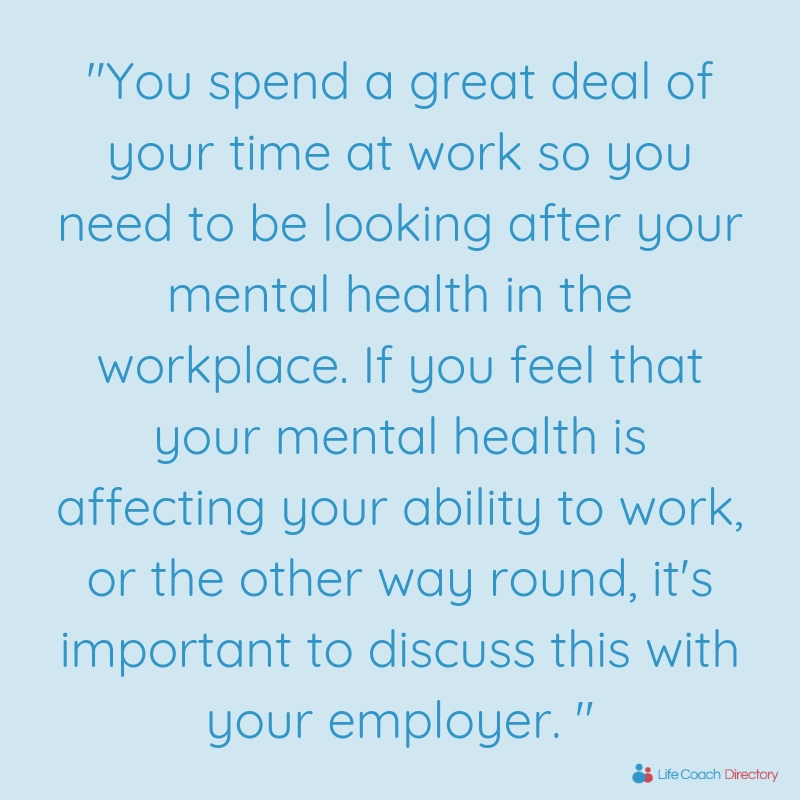 If you feel that your mental health is affecting your ability to work, or the other way round, it’s important to discuss this with your employer. 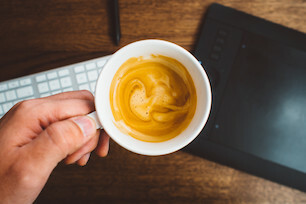 It is also important to consider what it is about your work that is affecting you – some things can be managed and changes can be made to help – but ultimately, if your place of work is affecting your health, it may be time to leave. Use the advice above to approach your employer and remember that you have legal rights if you don’t receive the support you need.